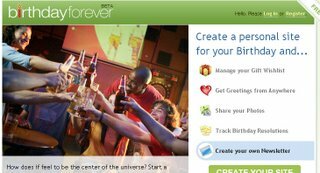 BirthdayForever.com is a website which makes your birthday all about you! You can manage a gift wishlist, share your photos with the world, receive greetings from anyone and anywhere, and keep track of your Birthday resolutions using our resolution tracker. You can also start your own Newsletter if you like.